Brionna Villa is a three-level, modern deluxe villa situated in Agia Triada and is surrounded by a lovely yard and a stone-brick wall. Indoors, there are 5 bedrooms, 5 bathrooms, a fully-equipped kitchen and a spacious elegant furnished living room with a fireplace. As you enter this exclusive property you will notice the stone built wall which surrounds the entire property and you will notice the barbecue facilities together with the clay oven and the swimming pool. The main entrance is decorated with a beautiful wooden solid door. You may take the large stairs or the ramp to enter this villa. Once you enter, you will see the bathroom with shower and then you proceed into a large living room which has a fire place and sliding doors which lead to a large veranda. Next to the living room you will find the fully equipped kitchen with dishwasher, stove with oven and fridge. Next to it you will find the bedroom which has 2 twin beds. You will take the stairs and you will go to the first level where you will find the main bedroom and toilet with large mirror. This bedroom has sliding doors leading to a large veranda. You will find the third bedroom which is also double room with en suite bathroom and has skylights where you can bath and see the stars in the night and the surrounding nature during the day. Next to it you will find the fourth bedroom with en suite bathroom shower with sliding door that leads to a veranda. 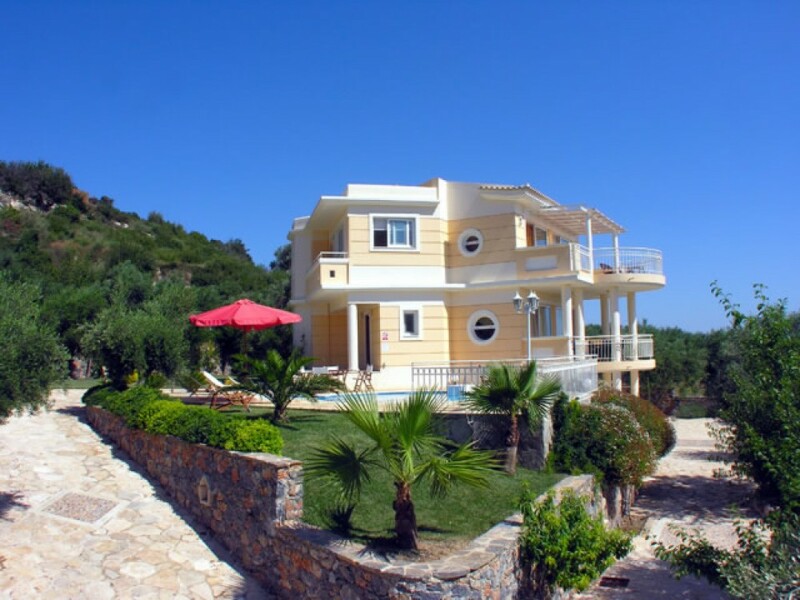 Villa Brionna offers air-condition and satellite television. To reach the fifth bedroom you will take the stairs to the lower ground where you will find one very large bedroom with en suite bathroom shower where you will find the washing machine. The view from the verandas is outstanding and panoramic as you look directly you will see at a distance the original village of Agia Triada and on the right hand side you will see the olive trees and on the left hand side you see the clear sea. A car is essential as the first available bakery is at a distance of 3 kilometers from this private and exclusive property.